After his unexpected death at 50, Anne, just 20, was left stunned. Gradually, she found solace for her grief by talking to his friends, poring over old correspondence, and recording her childhood memories. Now she shares personal photos, eloquent, revealing letters, and beautifully rendered scenes of his childhood, war years, and their family's time together. Idyllic summers in upstate New York, the years in Los Angeles, and the myriad ways he filled their time with laughter, strength, and endearing silliness--all are captured here with deep affection and candor. Though begun in loss, Anne's story is a celebration of her extraordinary relationship with her father and the qualities she came to prize through him--empathy, kindness, and an uncompromising sense of social justice. 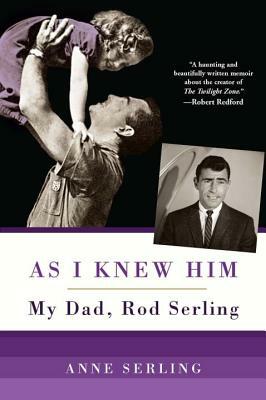 As I Knew Him is a lyrical, intimate tribute to Rod Serling's legacy as visionary, storyteller, and humanist, and a moving testament to the love between fathers and daughters. Before becoming a full-time writer, Anne Serling was an early childhood teacher with a bachelor’s degree from Elmira College. She serves on the board of directors of the Rod Serling Memorial Foundation and is involved with the Rod Serling School of Fine Arts “Fifth Dimension” program. She lives in New York. Visit her at www.anneserling.com or on Facebook.